European Union’s economic weakness continues to get worse, with further downward pressure from Brexit and immigration issues. Major EU banks asset quality worsens and this is impacting stock prices. Now select Indian Banks including HDFC Bank, ICICI Bank, Kotak Mahindra Banks and Axis Bank are valued much more than several major EU Banks including Deuteche Bank, Germany’s largest bank. HDFC Bank is valued more than Deuteche Bank and Credit Suisse (Switzerland’a largest bank) combined. 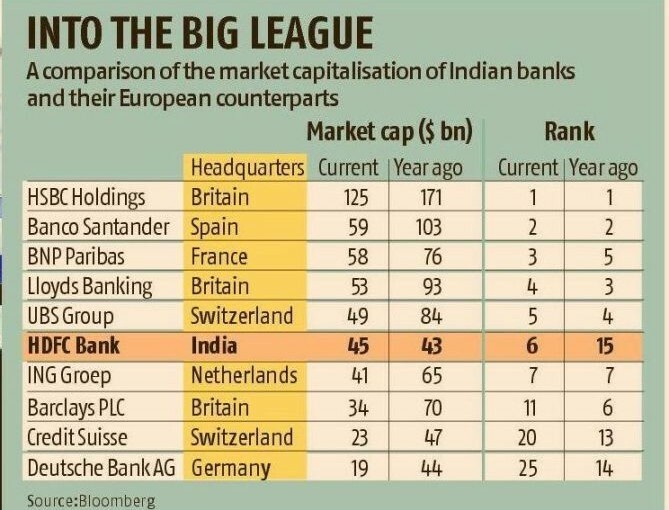 An interesting idea is that leading Indian banks above should consider buying such well established global banks to expand their global presence.